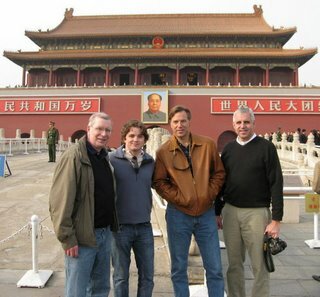 Here’s the group in front of the massive photo of our beloved leader, Chairman Mao. We had just toured the Forbidden City, which is a kilometer long with countless halls with names like the Hall of the Peaceful Benevolence of our Heavenly Intergalactic Emperor. Our tour guide explained that half of the forbidden city was for purposes of housing the Emperor’s 3,000 concubines. Only the Emperor and the eunuchs were allowed in that part of the city. There was much jocularity about being responsible for 3,000 concubines and, I’m sure, not original joke uttered. Where we are standing is facing Tiannemann Square. It is striking, but obviously not surprising, that the most historic event to have taken place there was unnoted. In the cosmopolitan environment that is Beijing, it takes an act of will to keep in mind the tumultuous politics below the surface of Chinese society.